Robocalls reached a record 3.36 billion in April of 2018, according to the voicemail and cell blocking app YouMail. That equates to 1,297 calls placed each second. Phone calls solutions provider First Orion estimates that fraudulent phone calls will make up 44.6 percent of all calls by 2019. That’s up from only 3.7 percent in 2017 and an estimated 29.2 percent in 2018. A bit of good news is that, if you have a landline, fraudulent calls to those lines are projected to drop 56 percent in 2019, down from 24.8 percent from 2017. One common tactic used by fraudulent phone scammers is to make calls from a user’s own area code, thus making the call seem more legitimate. Often, scammers leave a voicemail saying that you are “in serious trouble” and to “call this phone number immediately.” In most cases, the first part of the message identifying the caller or company is “conveniently” cut off, so you don’t know who the call came from. Department of Homeland Security Office of Inspector General (OIG) Hotline Scam: The caller pretends to be with US Immigration and alters caller ID to make it appear the call is coming from the DHS OIG hotline. The fraudster uses various tactics to elicit the victim’s personal information, often claiming the person called is a victim of identity theft. The truth is, the DHE OIG never uses its hotline for outgoing calls. FBI Spoofing Scam: This is similar to the DHS OIG Hotline scam. The caller pretends to be from the FBI and tells the person who picks up that they are being investigated for certain federal violations. The victim is told that if they don’t immediately pay a fee, they will be arrested. Caller ID often registers a legitimate FBI field office number. Pro tip: the FBI does not call or email private citizens to demand money or threaten arrest. 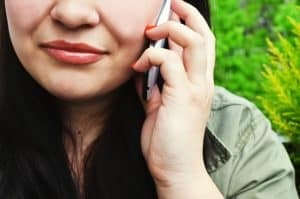 The “Can You Hear Me” Phone Scam: Scammers want the person called to say “yes.” They will record that “yes” and use it as a voice signature to authorize unwanted charges on the victim’s utility or credit card accounts. Smishing: Short for SMS phishing, it’s a new type of scam. It is a texting scam that looks legitimate. Scammers send text messages from what appear to be legitimate bank phone numbers. The text claims a victim’s debit card has been used to make a suspicious purchase, and if they do not recognize the transaction, they are to call the fraud prevention line at the number listed. The victim is then asked for their account number and other confidential information. The fraudsters then clean out the victim’s bank account. Never call the number. Get the legitimate bank phone number off the internet and call the bank. It’s almost guaranteed that the legitimate bank will know nothing about it. Phishing Call Scam: People are receiving phone calls from scammers pretending to be from Apple support. They tell the victim that their iCloud account has been hacked and they need to verify account details. They are then routed to a live person who is supposed to take care of the issue. The victim is asked for log-in information on their Apple account. Sometimes they are asked to pay a fee to install anti-virus software on their computer or phone. Then malware, not anti-virus software, is downloaded. Microsoft or Apple will never call to warn of a security problem. Hang up! Register all your phone numbers with the national Do Not Call registry (www.donotcall.gov). Try blocking nuisance numbers on your cell phones one at a time. I do this, but they always call again from a different number. Explore blocking services. Some names of services I’ve come across (but not tried personally) include YouMail, Hiya, NoMoRobo, RoboKiller, or Truecaller. Some carriers have various tools to fight robocalls, but they often charge up to $4 a month. These services usually only “identify” suspected junk calls. Some phones are smarter than others. iPhones get more scam calls than Android phones. Some newer phones are even “smarter” than older phones when it comes to scam calls. It will take research to find out which ones and what they do. If you don’t recognize the number, don’t answer the phone. If you do answer, and there is a distinct pause before the caller engages, hang up immediately. If someone leaves a voicemail that seems to be legitimate, independently research the phone number and the caller information on the internet and call back on a legitimate number for the company or entity they identify. Know that most legitimate agencies will never call and threaten over the phone. Government agencies, like the “alleged” IRS, most often use the US mail. Report any suspicions independently to the federal agency being represented. Also report suspicions to the Better Business Bureau Scam Tracker and to the FCC Consumer Help Center. Always maintain a healthy dose of suspicion and skepticism, especially around callers or phone numbers you don’t know. Independently verify if you feel the need to call back and use that phone number, not the one they gave you. Good luck. It’s getting tougher to stay safe over the phone.